This page describes the steps required to get PlanarRad running on a fresh install of Ubuntu 13.04 or Fedora 19. It should also work on similar recent versions of Ubuntu or Fedora, and for other Linux distros the information here may help you to get PlanarRad working. PlanarRad is part of a codebase called 'jude2' which is a set of libraries and executables written in C++. Installing PlanarRad on Linux involves compiling these libraries and executables from the source code, which is what is in the PlanarRad tarball downloadable here. 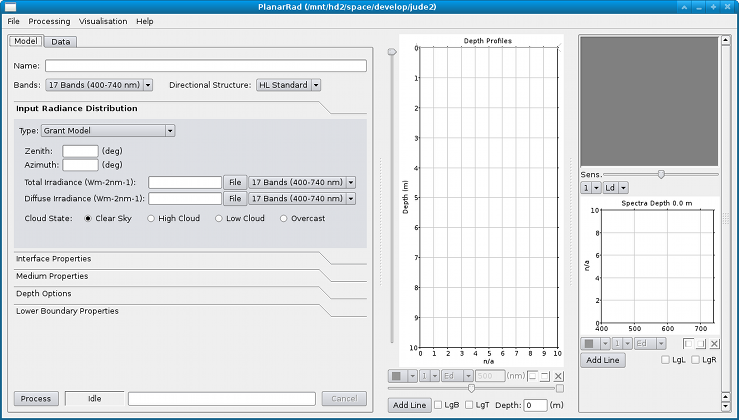 The PlanarRad code requires some other software libraries and tools to be installed. Possibly some of these are on your system already, but for a fresh install of Ubuntu 13.04 or Fedora 19 the following lists the packages that need to be installed. To install them you need super-user priviliges on your system. Either 'su' to become root or if you can 'sudo' then type, for example. You do not need super-user privilidges again, so if you used 'su' do not stay as the root user. The PlanarRad compilation process needs to know where to put the software when it has compiled it, and also your system needs to know how to find the software executables and libraries so you can run it. The install location is specified by the environmental variable 'JUDE2DIR'. Setting JUDE2DIR isn't strictly necessary but it is advised, in particular the scripts to generate the Hydrolight comparison document require it to be set. On Ubuntu add something like the following to the end of the '.profile' file in your home directory. On Fedora add it to the file '.bash_profile'. The result should be similar to '/home/john/jude2_install', if it's a blank line something went wrong. With JUDE2DIR set as above the compilation process will install the software in the directory 'jude2_install' under your home directory. Another reasonable choice would be '/usr/local/jude2_install' but in that case create the directory first and set it so you have write permissions. If the build fails, in particular if the error is something to do with Qt, look at the contents of the directory 'pretend_qt4_dir'. It may be that some of the symlinks need to point somewhere else on your system. Note that 'exmaple_build' as it stands will write over any changes you make there, so modify that as well if you make changes. One possible complication is if you have Qt5 and Qt4 on your system, I haven't tested that, but the symlinks attempt to point directly to the qt4 versions of the Qt tools (PlanarRad needs Qt4). This page was last modified on 2 February 2014, at 14:17.